1. Our investment opportunity set. Tacita Capital accesses investments from the fullest possible range of Canadian and global asset classes and strategies to design portfolios that seek superior risk-adjusted returns in a cost and tax efficient manner. Our portfolios are constructed using investments from 6 different asset classifications which are further segmented into 48 different sub-asset classes to achieve robust diversification for every client. The 48 sub-asset classes we use to engineer client portfolios are broadly categorized into three major components which are tailored to the specific risk and return parameters of each client’s investment strategy. The efficiency component targets enhanced returns from exposure to various dimensions of the equities market or factors (e.g. value, low volatility, small company) via low cost exchange traded funds. 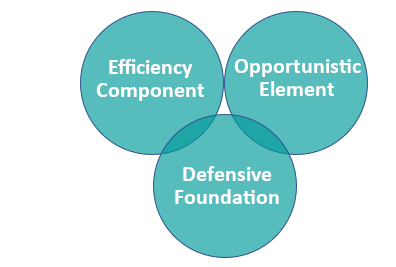 The defensive foundation is comprised of cash equivalents, investment-grade bonds, select commodities and hedged strategies designed to cushion the impact of market declines. 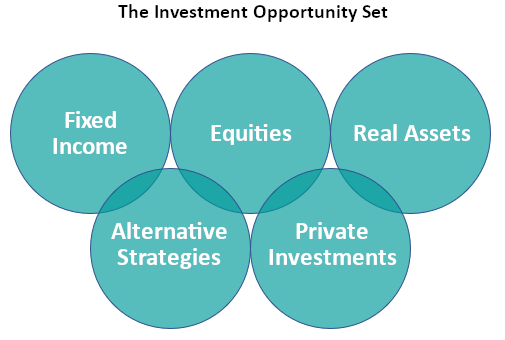 The opportunistic element seeks superior potential returns from niche active managers, quantitative multi-factor strategies and private debt, equity, real estate and specialty investments. We access investments from the entire universe of investment vehicles – individual securities, exchange traded funds, low cost mutual funds, closed-end funds, private pools and limited partnerships. Investment vehicles and managers must meet our extensive and rigorous due diligence requirements before we will utilize them in client portfolios. All existing vehicles and managers are monitored on an ongoing basis including tax efficiency. Tacita Capital capitalizes on the rapid pace of change in the exchange traded funds and specialty manager realms to select new vehicles which reduce costs and improve portfolio diversification. Similar to leading pension plans, Tacita Capital manages selected mandates internally where we believe we can improve our clients’ portfolio results through cost reduction, improved tax efficiency and/or superior potential returns. Internal mandates include Canadian investment grade bonds, Canadian preferred shares, Canadian value/quality stocks and Canadian real assets.